Islamic State militants have been pushed back from the ancient Syrian site of Palmyra, officials and a monitoring group say. Militants seized part of the town of Tadmur on Saturday, which is located on a strategic east-west route next to Palmyra's World Heritage-listed ruins. Nearly 300 have reportedly died in four days of fighting. Meanwhile, the number of militants reported killed in a rare US ground raid in Syria on Saturday rose to 32. The Syrian Observatory for Human Rights, a UK-based monitoring group, said that among those killed were "IS oil chief Abu Sayyaf, the deputy IS defence minister, and an IS communications official". US officials had said about 12 militants were killed at the scene of the raid in the eastern province of Deir al-Zour. They said Abu Sayyaf had been killed in a firefight during the special forces raid, and his wife was captured. The Syrian Observatory said at least 295 people had been killed since IS began advancing on Palmyra on Wednesday. It said they were mainly militants and government troops, though it said 57 civilians were also killed, including dozens executed by IS. Militants had pulled out of the northern parts of Tadmur, but still held a village north of Palmyra, the group said. The Unesco World Heritage site is located on the road that leads from the contested eastern city of Deir al-Zour to the city of Homs and the capital, Damascus. It is also close to gas fields and home to a major airbase. "Palmyra is safe and the road linking Homs with Palmyra is absolutely safe," Talal Barazi, governor of Homs province, told state-run news agency Sana. It's not yet clear that the apparent retreat of the IS militants from the northern parts of Palmyra and in other areas means that the back of their assault on the city has been broken. They remain in control of some of the surrounding countryside and are still attacking Tadmur prison and some significant oil and gas installations. Those, and the strategic position of Palmyra controlling the main route to the east from Damascus and Homs, are IS' main interest in the affair, rather than the temples and colonnades of the World Heritage Site. But there's little doubt that if they were able to settle in, the militants would soon turn their attention to the site, having demolished similar treasures in Iraq, seeing them as symbols of idolatry. The campaign at Palmyra has underscored IS' extraordinary ability to wage war on several fronts simultaneously - notably at Ramadi in western Iraq - despite intensified coalition air strikes. Maamoun Abdulkarim, Syria's head of antiquities, said the army was in control of the whole of Tadmur, including the outskirts, and that the ruins south-west of the town - already damaged in previous fighting - had not suffered further harm. However, IS fighters continue to hold positions around Palmyra and to the east, including parts of a gas field, and they have been attacking an important prison facility. 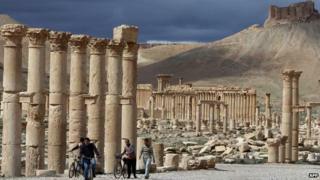 IS has ransacked and demolished several ancient sites that pre-date Islam in Iraq, leading to fears that it might attempt to damage or destroy the Palmyra ruins. The militant group took control of control of swathes of territory in north-eastern Syria and northern Iraq last year.